1852 Weimar Geo Inst. Map - "Das Chinesische Reich"
The following map was published by the Weimar Geographisches Institut in 1852. Among the countries the map shows are Korea and Japan. 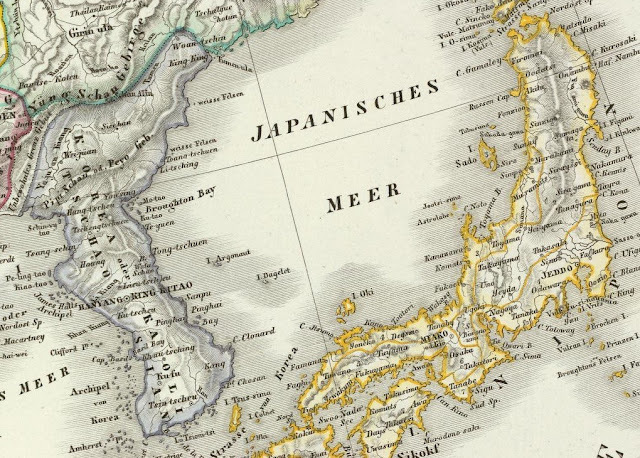 In the Sea of Japan, the map also shows "I. Dagelet" and "I. Argonaut," which were "Ulleungdo" (Dagelet) and a non-existent, mismapped Ulleungdo (Argonaut). 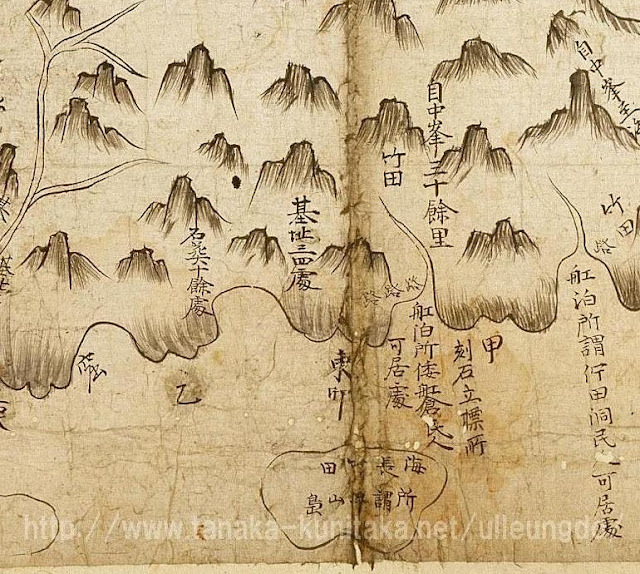 Below is a great photo of the map Ulleungdo Inspector Bak Seok-chang (朴錫昌) made of Ulleungdo during his inspection of the island in 1711. The map is from Mr. Tanaka Kunitaka's Web site HERE. The bottom of the map represents the east shore of Ulleungdo. The small island just off the east shore is labeled "the so-called Usando" (所謂 于山島). On the same island is also written "groves of haejang bamboo" (海長竹田). Two kilometers off the east shore of modern-day Ulleungdo is a small island named Jukdo, which has groves of haejang bamboo on it. Also, notice the three prominent peaks in the center of the map. Because of those three peaks, Ulleungdo was sometimes called "Sambongdo" (三峯島), which means "Island of Three Peaks." Koreans claims that Usando was the old Korean name for Liancourt Rocks (Takeshima / Dokdo), but this 1711 Korean map is clear evidence that Usando was the old name for Ulleungdo's neighboring island of Jukdo. Liancourt Rocks are just barren rocks with no soil to grow haejang bamboo. 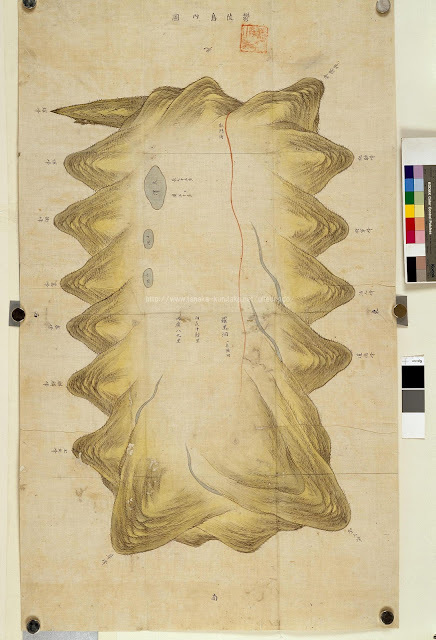 Mr. Tanaka has posted the great photo of Lee Gyu-won's 1882 "Inner Ulleungdo Map" (鬱陵島內圖) below on his Web site HERE. The map is only of the interior of the island. It does not shore the shoreline or any surrounding islands. 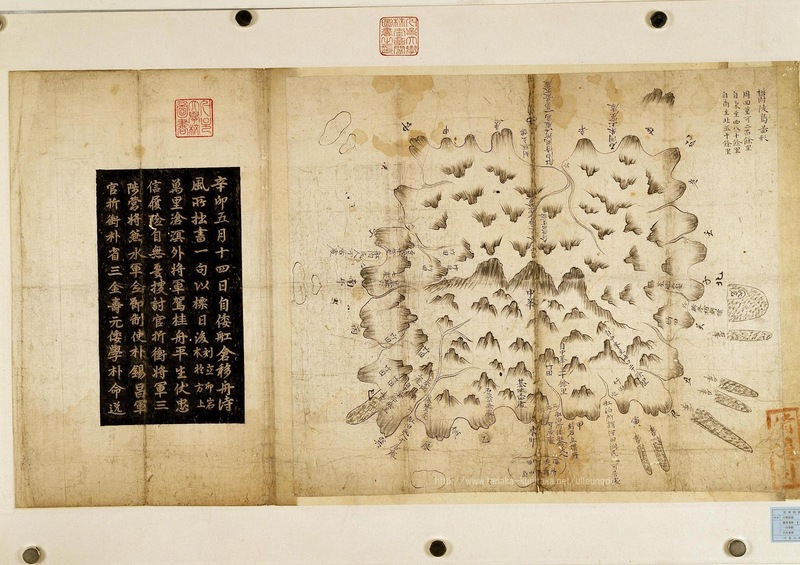 The protrusions on the outer edge of the map represent mountain peaks. Also, Mr. has written that he will post the "Outer Ulleungdo Map" (鬱陵島外圖), which is the mate to the map below, on September 22. The "Outer Ulleungdo Map" shows the shoreline and surrounding islands and rocky islets. I cannot wait to see a good, detailed photo of that map. Yomiuri Simbun Editorial - "Govt must stress sovereignty over isles to intl community"
It is vital for Japan to make the legitimacy of its territorial claim and the reasoning behind it widely known to the international community by taking the dispute to the international court. The government also needs to make efforts to help as many people as possible properly understand the Takeshima issue by explaining it thoroughly. When Shimane Prefecture established "Takeshima Day" in 2005 to commemorate the 100th anniversary of the incorporation of Takeshima into the Prefecture, the Japanese public did not seem all that interested in the Takeshima dispute. Now, however, there seems to be much more Japanese interest. I think there are two main reasons for the increased interest. One is that the Japanese public have learned much more about the history of Takeshima, which many now believe proves undeniably Japan's claim to the islets. The other may be that the Japanese have lost patience with all the Takeshima-related, anti-Japanese antics in South Korea. In other words, they have gotten tired of all the Korean stunts meant to say, "Hey, Japan, we've got your island. Nayh, nayh, nayh, nayh, nayh!" In the August 25 Yonhap/Reuters photo below, South Korean high school students play basketball on Takeshima (Liancourt Rocks / Dokdo), where they were shipped to once again say to Japan, "Nayh, nayh, nayh, nayh, nayh!" "Seoul to remove 'illegal' base of monument erected on Takeshima islet"
The Japanese newspaper Asahi Shimbu reports HERE that the South Korean government has said that the circular base for the "Dokdo" monument to the left, which was erected on Liancourt Rocks by Koreans, was constructed illegally and must be removed. The monument, which was unveiled on August 19, was erected by North Gyeongsang Province without obtaining permission from the central government in Seoul. However, on the back of the monument is engraved with "President Lee Myung-bak, Summer of 2012" in the Korean President's own handwriting. The Korean name from the island is written in Korean on the front of the monument. The Korean central government has said that the part of the monument with the inscription can stay, but the circular base must go. Known as Dokdo in South Korea, the islands have been occupied by South Korea since the early 1950s despite a lack of legal authorization from either Japan or the United Nations. As regards the island of Dokdo, otherwise known as Takeshima or Liancourt Rocks, this normally uninhabited rock formation was according to our information never treated as part of Korea and, since about 1905, has been under the jurisdiciton of the Oki Islands Branch of Shimane Prefecture of Japan. 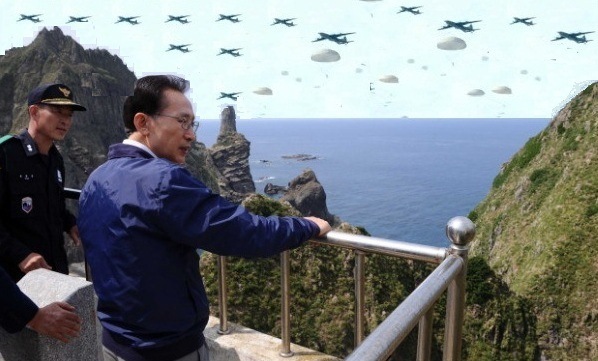 The island does not appear ever before to have been claimed by Korea...."
The Korean newspaper Chosun Ilbo reported HERE that Korea would return the undelivered letter Japanese Prime Minister Yoshihiko Noda wrote to Korean President Lee Myung-bak protesting his visit to Liancourt Rocks. The reason given for returning the letter was that it violated diplomatic protocol since its contents had been announced in advance. Korea also claimed the letter was inaccurate since it referred to the Rocks by the Japanese name instead of the Korean. According to an article in the the Japanese newspaper Asahi Shimbun HERE, Korean embassy officials trying to return the letter were turned away at the gate of the Japanese Foreign Ministry because they had not made an official appointment. UPDATE: Jiji Press - "Japan Refuses to Accept Takeshima Letter Returned by Seoul"
Seoul, Aug. 23 (Jiji Press)--Japan's Foreign Ministry refused to accept a letter Thursday that was sent by Prime Minister Yoshihiko Noda to South Korean President Lee Myung Bak but returned. An official at the South Korean embassy in Tokyo visited the ministry to return the letter, but the ministry refused to meet the official. 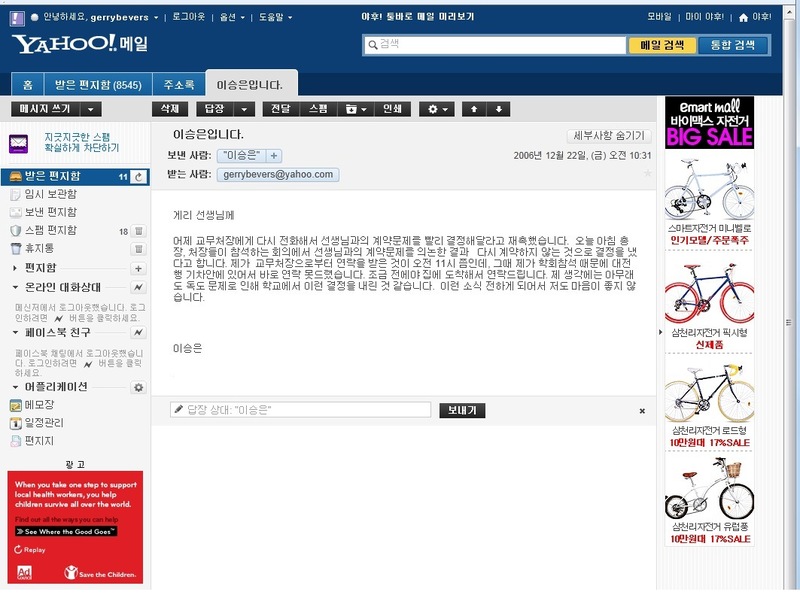 Following this, the South Korean embassy sent the letter back by registered mail. Due to the unusual diplomatic spat, the bilateral relationship looks certain to deteriorate further. In the letter, sent Friday, Noda criticized Lee's unprecedented visit to the Sea of Japan islands of Takeshima, controlled by South Korea, on Aug. 10 and expressed regret over Lee's remarks on seeking an apology from Emperor Akihito for Japan's past colonial rule. According to the Yonhap news agency, a senior official of the South Korean presidential office said, "It makes no sense to reply to comments that are not true." The news agency quoted a South Korean government source as saying: "Even if our response [to Japan] is seen as diplomatically rude, there is no reason to change our principles on this matter. If we see this issue from the other side, Japan also has gone against diplomatic protocol in sending [Noda's] personal letter." Chief Cabinet Secretary Osamu Fujimura expressed concern over the issue. "Regarding diplomatic protocol, I can't think of a letter sent from a national leader to another leader being returned," he said at a press conference Thursday morning. A senior Foreign Ministry official said, "The fact that South Korea has decided to take an unusual step in response [to Noda's letter] may prove that the nation is shocked by Japan's objections [to Lee's remarks and actions]." "If Japan lodges a protest with Korea over Dokdo, it should bet Tsushima." Personally, I think it is a great idea. Japan agrees to take its claim to Tsushima to the International Court of Justice (ICJ), and Korea agrees to take its claim to Dokdo, and both countries agree to abide by the Court's rulings. In other words, Japan bets its 1,500-plus-year claim to Tsushima and 400-plus-year claim to Liancourt Rocks (Takeshima / Dokdo) against Korea's claims to the two islands. I would like to nominate that Korean diplomat for a Noble Peace Prize. 1954 - "Report of the Van Fleet Mission to the Far East"
Between April 26 and August 7, 1954, retired 4-star General James Alward Van Fleet traveled to Asia as a Special Ambassador for US President Dwight D. Eisenhower to chronicle a survey of the United States Military Assistence Programs in the Far East. 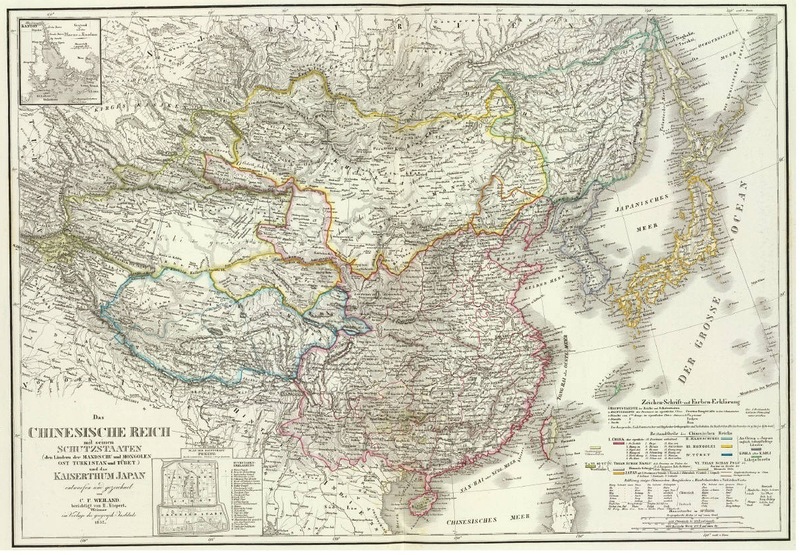 He and his team conducted surveys of the military, economic, and political situation in the region. 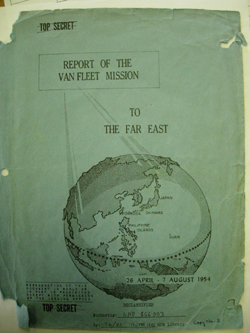 The report was submitted to the US President on October 4, 1954. General Van Fleet had fought in World I, World II, and the Korean War. In 1951 he replaced General Matthew B. Ridgway as commander of the US Eight Army and United Nations Forces in Korea. His only son, Captain James A. Van Fleet, Jr. was a B-26 bomber pilot during the Korean War, where he was killed. When he retired from active duty in 1953, his medals and awards included three Distinguished Service Crosses, three Distinguished Service Medals, three Silver Stars, four Bronze Stars, and three Purple Hearts for wounds received in combat. President Harry S. Truman described him as "the greatest general we have ever had...." He died on September 23, 1992 at the age of 100. 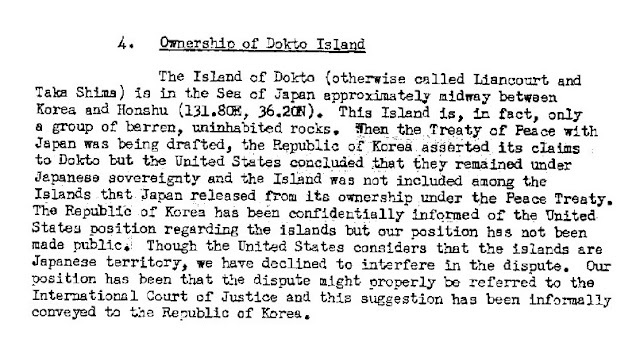 In his "Top Secret" 1954 report, Special Ambassador Van Fleet included a topic entitled "Ownership of Dokto Island," where he comfirmed that the United States and the "Treaty of Peace with Japan" recognized "Dokdo" as Japanese territory. He wrote that South Korea had been confidentially informed of the US position, but that the US position had not been made public. The United States is vitally interested in the establishment of close and friendly relations between Japan and the Republic of Korea. The security of the two countries against the Communist threat from the Mainland of Asia is inextricably intertwined, and failure to achieve a rapprochement between them creates grave weaknesses from a security point of view that the Communists have sought and will continue to seek to exploit. For these reasons, the United States must endeavor in every way feasible to bring about a rapprochement between the two countries and mutually satisfactory settlement of the major problems outstanding between them. The failure to achieve settlement thus far stems basically from the lingering hostility between the two peoples resulting from Japan's long rule over Korea. The bitter experiences of the Koreans under the Japanese rule understandably left a deep hatred and distrust of Japan in the minds of Koreans. These strong emotions representing the past seem to be more real in their minds that the present. They fear a renewal of Japanese aggression and view every Japanese move with suspicion. They are alarmed at Japan's reviving strength. It is believed that the Japanese would like to forget the past--which holds unpleasant memories for them as well as the Koreans. They do not believe that their 40-year occupation of Korea was an entirely unmixed evil. Japan believes that if it was indebted to Korea, the debt was more than taken care of by the transfer to the Republic of Korea Government of Japan's entire public and private holdings in Korea at the end of World War II. Basically, both countries wish to establish normal diplomatic and commercial relations; they wish to trade with each other despite certain official utterances to the contrary. Of the several problems at issue between Japan and Korea, the fisheries problem is by far the most important, not only because it is of vital concern to the Japanese (a nation that lives on fish) but because the Republic of Korea Government has taken overt action against Japanese fishermen apprehended fishing in the Sea of Japan (or Eastern Sea, as the Koreans call it) approximately 60 miles from Korean shores. The Japanese have eagerly sought a settlement with the Republic of Korea. As for the Koreans, they are genuinely concerned over the possible depletion of their fisheries resources by the superior Japanese fishing fleet. This is particularly acute for the Koreans because they do not have adequate vessels and equipment and trained personnel to fish in waters that are not closely adjacent of Korea. This problem involves the enforcement of the so-called "Rhee Line" or "Peace Line" in the Eastern Sea. The essential facts are that the Republic of Korea Government has unilaterally proclaimed its sovereignty over a large area of the high seas bordering Korea and by the use of the Republic of Korea Navy has attempted to exclude Japanese fishermen from operations within the area. At times, the Republic of Korea Navy has fired upon Japanese vessels; some of the vessels have been apprehended and taken to Korean ports. After the crews have been tried and sentenced, most of the captured fishermen have been released, but the vessels usually have been detained and are now being reportedly operated by the Republic of Korea. It is believed that the Japanese Government is willing to enter into a reasonable fisheries conservation agreement that would guarantee the preservation of the fisheries and restrict Japanese operation in the area. c. Sea defence against Communist infiltration. The position of the Republic of Korea Government has been to insist on the recognition of the so-called "Peace Line." 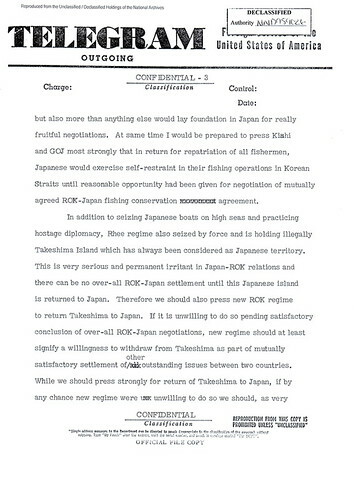 The United States Government has consistently taken the position that the unilateral proclamation of sovereignty over the seas is illegal and that the fisheries dispute between Japan and Korea should be settled on the basis of a fisheries conservation agreement that would protect the interests of both countries. The chronology and other aspects of the fisheries is discussed in more detail in Enclosure No. 1. The Republic of Korea contends that the Koreans, resident in Japan on August 9, 1945, who now reside there, should be given treatment more favorably than that given to the average foreign national in Japan. There are now approximately 600,000 Koreans in Japan. A substantial number of these Koreans were conscripted laborers who were forcibly taken during World War II for Japanese production purposes. They were compelled to work in the mines and military factories. A tentative argument on the nationality status and treatment of the Koreans residents in Japan was reached at the second Japanese Conference of February-April 1952. It was agreed that all should be regarded as citizens of the Republic of Korea, and that, except for illegal entrants, they would be entitled to special treatment to enjoy many privileges ordinarily reserved for Japanese citizens. The agreement , however, has not come into effect because the Conference broke down over other issues. It is understood that the Republic of Korea refuses to approve this agreement until all outstanding issues were settled. It would seem that the settlement of the problem of the Korean residents in Japan should not prove unduly difficult, if and when general settlement of other outstanding issues is reached. If relations between Japan and Korea continue to deteriorate, however, the Korean minority problem will become increasingly acute. It is understood that a high percentage of the Koreans in Japan, excluded from normal occupations, are on Japanese relief rolls or engaged in illegal activity and many of them are active Communists. These facts do not endear the Korean residents to the Japanese; retaliatory measures against the Korean minority by the Japanese Government--or by the Japanese people themselves-- remain distinct possibilities. The Republic of Korea advised this Mission that the Koreans "now live in a sort of 'no man's land', neither Japanese nor Korean, deprived both of the protection afforded to Japanese nationals under Japanese laws, ad of status of foreign nationals as provided in international law. Depending upon circumstances, they were sometimes treated as Japanese and, at other times, as foreign 'stateless' persons. They had no recourse to law or means of remedy against many discriminations which operated against them. * * * "
The current trade relations between the Republic of Korea and Japan are not satisfactory; recent developments show little prospect of early improvement. Apparently, discrimination against Japan by the Republic of Korea continues, on a de fact basis, despite which equal treatment was provided for Japanese bidders. Only after pressure on the Republic of Korea Government by actual withdrawal by certain Foreign Operations Administration authorizations were these revisions made in the Korean Import Procurement Regulations. Notwithstanding this revision in the Korean Import Procurement Regulations, the Japanese Government has recently informed the United States Ambassador in Tokyo that various devices and pressure are being used to prevent the placing of orders in Japan for goods to be used in Korea. These include the following--Korean firms state they have been told that if they purchase in Japan, they would be denied credit facilities at the Bank of Korea and would be black-listed by the Korean Procurement Agency for any future business regardless of the source of supply. It seems clear that the Korean Government does not intend to comply with the new Import Procurement Regulations since the embargo against Japan is apparently retained in full effect. This action on the past of the Korean Government obviously prevents Korea from receiving the benefits of lower priced Japanese goods with this added advantage of early delivery; increases the cost of the Korean Procurement Program, thereby reducing its possible scope; it prevents United States dollars doing double duty by assisting in the support of Japanese economy (urgently needed because of the decline in special dollar receipts arising from offshore procurement and expenditures by security forces) as well as in rehabilitating Korea. The trade balance between Japan and Korea over the past few months has not been favorable; the outstanding balance that Korea owes Japan amounts to approximately $37,000,000. The United States Ambassador in Tokyo states that the Koreans have cited this unfavorable balance of trade as evidence of Japanese embargo against Korean exports to Japan. Japan recently developed an import program for Korean products that include rice, laver (seaweed), and certain other products that are estimated at approximately $21 million annually. Moreover, Japan has indicated a willingness to purchase substantial quantities of Korean rice provided the price is not greatly in excess of prices in other supplying countries. To date, the amount of rice exported to Japan, the natural export market for Korean rice, has not approached that exported in prior years. Early in September 1953, the Republic of Korea, on the basis of the bumper rice crop, planned to export 150,000 to 200,000 metric tons of rice to Japan. The Republic of Korea believed that these rice exports to Japan would provide the necessary foreign exchange to import an equivalent tonnage of cheaper grains together with a net gain of $20 million of foreign exchange. The Republic of Korea did not begin to purchase rice for export until December 10, 1953, and it was slow in making money available for rice purchases. Only about 120,000 tons of rice, therefore, became available for export. The unresolved problem relates to the price at which the Republic of Korea will receive for the rice exported to Japan. It is reported that Japan can buy rice from Formosa and other Southeast Asian countries at $195 to $210 per ton delivered. and United States rice from California at $205 per ton delivered. The Republic of Korea, however, on the basis of the official rate of exchange of 180 Hwan to $1 calculates that it has made an investment of $290 per ton in the rice purchased for export. For this reason, and possibly for bargaining purposes, the Republic of Korea officials have asked $290 per ton. It is reported that Japan has offered $225 per ton for Korean rice if the proceeds are applied to the current indebtedness of the Republic of Korea to Japan under the Republic of Korea-Japan Trade Agreement, or $200 per ton if the proceeds are in free exchange. The Korean rice has always commanded premium price because it is considered the best rice by the Japanese. The exportation of rice to Japan has become entangled with other economic and political questions including the factors involved in the breakup of the Republic of Korea-Japan talks in late 1953 precipitated by certain ill-advised statements about Korea by the Japanese delegate, Kubota (see page 25); the dispute between the Republic of Korea over each other's performance under the trade agreement; and the embargo by the Republic of Korea on trade with Japan. The official position of the Republic of Korea is that its embargo policy is justified because of Japan's trade restrictions against Korea. Figures are cited showing that Korean exports to Japan amounted to $8 million during the 12-month period ending March 31, 1954, that is, only one-half the amount mentioned in the target in the trade agreement; whereas, imports from Japan (including Foreign Operation Administration financed imports) total almost $65 million, or more than double the target mentioned in the trade agreement. The deficit in Korean exports to Japan was in commodities other than rice because rice was not a specified commodity in the trade agreement. The Japanese are also charged with imposing deliberate restrictions on imports from the Republic of Korea and with over-pricing and poor quality of Japanese exports to the Republic of Korea. On the other hand, Japan complains that the indebtedness of the Republic of Korea under the trade agreement has risen far above the swing limit provided for in the agreement, and that payments are long overdue. The problem incidental to exporting rice to Japan can be readily solve once the basic issue of Republic of Korea-Japanese relationships is solved. It is important, however, that Republic of Korea export substantial quantities of rice to Japan or to some other country. The Foreign Operations Administration Agricultural Mission in 1953 and the Nathan Associates in 1954 regarded rice as the most important of Korea's potential exports and one that must eventually be increased to about 500,000 tons per year. It is, therefore, important for the Republic of Korea to export rice and Japan is its natural market. Immediate exportation of the present stocks is desirable if deterioration or damage by insects is to be prevented. "What is still worse is that Japan now claims the possession of the little islet of Dokto known Liancourt Rocks near the Woolnungdo known as Dagelet. Japanese officials are making frequent visits to the islet with armed vessels molesting Korean fishermen there. They set up posts here and there in the islet with description declaring as if it were Japanese territory. Throughout our history and knowledge up to the very moment of the declaration of sovereignty over adjacent seas (Rhee Line), Korea's sovereignty over it has never been contended by any country, as it has long been an immovably established fact that the islet, Dokto, has been historically as well as legally a part of Woolnungdo (Dagelet) Korean territory." 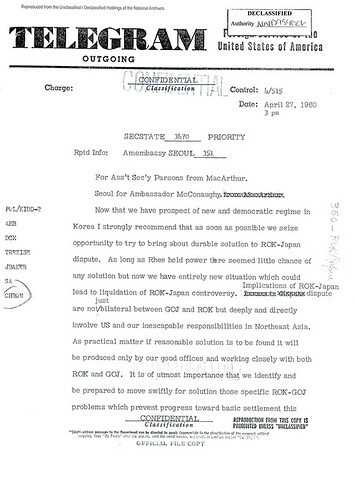 On 27th April, 1960, American Ambassador Douglas MacArthur II sent telegram to J. Graham Parsons, Assistant Secretary of State for East Asian and Pacific Affairs, in Washington, and in it, he says that “Therefore we should also press new　ROK regime to return Takeshima to Japan.” We already knew that U.S. warned ROK that Takeshima is Japanese island in both 1951 and 1952. Now that we have prospect of new and democratic regime in Korea I strongly recommend that as soon as possible we seize opportunity to try to bring about durable solution to ROK-Japan dispute. As long as Rhee held power there seemed little chance of any solution but now we have entirely new situation which could lead to liquidation of ROK-Japan controversy. Implications of ROK-Japan dispute are not just bilateral between GOJ and ROK but deeply and directly involve US and our inescapable solution is to be found it will be produced only by our good offices and working closely with both ROK and GOJ. It is of utmost importance that we identify and be prepared to move swiftly for solution those specific ROK-GOJ problems which prevented progress toward basic settlement this festering dispute. We do not know what response Communists may make to new ROK regime and it is vital we try to put ROK-GOJ house in order as soon as possible. While Rhee regime violated most basic tenets of democracy in authoritarian police rule imposed on Korean people, it has also in past done violence to most fundamental principles of international conduct and morality by committing acts of piracy on high seas around Rhee Line and then imprisoning and holding as political hostages Japanese fishermen and by seizing and holding non-Korean territory by force. The uncivilized practice of hostage diplomacy is one of our serious charges against Communist China and if continued by ROK it will be a great liability to a new democratic ROK regime. I therefore recommend strongly that as soon as new regime is in control in Korea (whether or noti it be of interim character) we use all our influence to persuade it (1) to release and return to Japan all repeat all Japanese fishermen hostages (including those who have not completed their sentences) who have suffered so cruelly from Rhee’s uncivilized and oppressive acts and (2) to cease practice of seizing Japanese fishing vessels on high seas. This would not only rid new ROK reegime of liability of practicing hostage diplomacy but also more than anything else would lay foundation in Japan for really fruitful negotiations. At same time I would be prepared to press Kishi and GOJ most strongly that in return for repatriation of all fishermen, Japanese would exercise self-restraint in their fishing operations in Korean Straits until reasonable opportunity had been given for negotiation of mutually agreed ROK-Japan fishing conservation agreement. In addition to seizing Japanese boats on high seas and practicing hostage diplomacy, Rhee regime also seized by force and is holding illegally Takeshima Island which has always been considered as Japanese territory. This is very serious and permanent irritant in Japan-ROK relations and there can be no over-all ROK-Japan settlement until this Japanese island is returned to Japan. 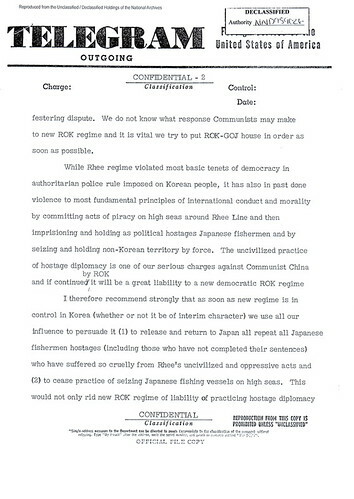 Therefore we should also press new ROK regime to return Takeshima to Japan. If it is unwilling to do so pending satisfactory conclusion of over-all ROK-Japan negotiations, new regime should at least signify a willingness to withdraw from Takeshima as part of mutually satisfactory settlement of other outstanding issues between two countries. While we should press strongly for return of Takeshima to Japan, if by any chance new regime were unwilling to do so we should, as very minimum, insist that they agree to submit matter to International Court of Justice for arbitration. Finally, we should inform new regime very clearly that it must be prepared to adjust its relations with Japan on terms of reciprocity, in such matters as diplomatic missions, visits by businessmen and journalists, commercial trade. Japanese have suffered Rhee’s occupation-minded approach for eight years and will be unwilling to accept such indefensible treatment from his successor. In its own interests, new regime should start with conformity with normal international standards of conduct, and could most usefully begin (in terms of Japanese and other free world opinion) by permitting Japanese diplomatic mission to enter and function in ROK on same terms ROK Embassy operates here. If we now move swiftly with new ROK regime which should generally be receptive to our views because of our helpfulness, we may have initial opportunity, which may never reoccur, to influence its position on Japan-ROK problem. Japanese would certainly welcome warmly and reciprocate fully, measures indicating new ROK regime willing take “new look” at Japan. Douglas MacArthur II is a nephew of General MacArthur and an American diplomat. He served as U.S. ambassador to Japan from 1957-1961. 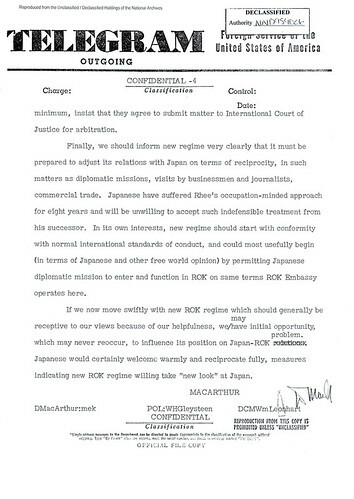 The original documents are from Nikaidou.com with his permission. Thanks opp, for important information. 1952 - Dec 4 - “American Embassy’s Note Verbale No.187” - U.S. iterates Rusk Note to ROK. Asahi Shimbun - "Takeshima issue explained in Q&A format"
It is a pretty good article, but it oversimplifies the answer to the question, "What about the history?" It fails, for example, to mention that while Japan has numerous maps and documents to support her claim to Liancourt Rocks (Takeshima/Japan), Korea has none to support hers. Also, how can Korea claim the Rocks were "taken by force" in 1905 when the Rocks had never been part of Korean territory or even had Koreans living on them? In fact, the only way Koreans could get to the Rocks at the time were as deckhands on Japanese fishing boats. South Korean President Lee Myung-bak's surprise visit to the disputed Takeshima islets on Aug. 10 sent relations with Japan into a tailspin. Question: What was the Japanese government's reaction to Lee's visit? Answer: Both Prime Minister Yoshihiko Noda and Foreign Minister Koichiro Genba lodged strong protests. 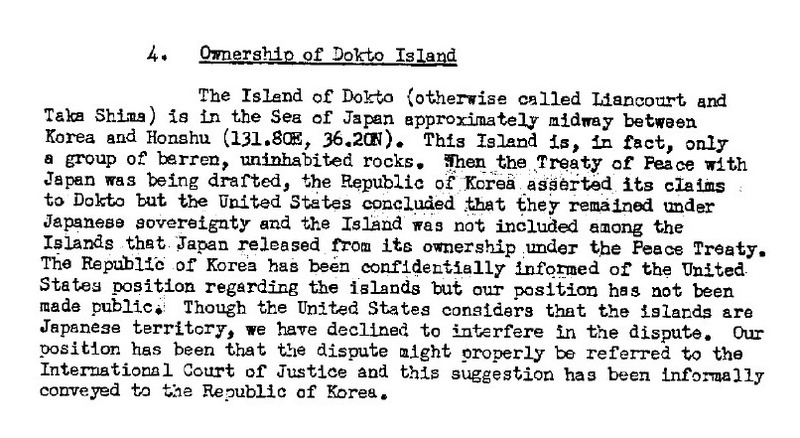 Q: What is the Japan's position with regard to the islets, which are called Dokdo in Korean? A: While South Korea claims the islets, Tokyo maintains they are Japan's sovereign territory, both historically and under international law. It also maintains that South Korea is illegally occupying them. Q: What is at issue right now? A: Lee's visit to Takeshima was an affront to Japan. Here was the leader of a country landing on territory it illegally occupies. His visit was completely unacceptable for the Japanese government. Q: Why does Japan maintain that South Korea is illegally occupying the islets? A: The 1951 San Francisco Peace Treaty stipulates all territory that Japan should renounce all rights, titles and claims to. But it does not include Takeshima. Then in January 1952, South Korean President Rhee Syngman one-sidedly declared the Rhee Syngman Line, or boundary, on the open sea, putting Takeshima on the South Korean side. South Korea went ahead and stationed security forces on the islets, effectively placing them under its control. A: Japan claims it established sovereignty of the islets early in the Edo Period (1603-1867). Takeshima was incorporated into Shimane Prefecture based on a Cabinet decision in 1905. That same year, Japan declared that Korea no longer has diplomatic sovereignty as it moved to annex the Korean Peninsula in 1910. This is why South Koreans regard the islets as having been "taken by force." As a result, the issue has stirred up patriotism and anti-Japan sentiment among South Koreans. Q: How has Japan coped with the problem? A: In 1954 and 1962, Japan proposed to South Korea that the dispute over sovereignty be referred to the International Court of Justice. But South Korea rejected the idea. So far, Japan has refrained from taking the matter to the court out of consideration for its peaceful relationship with South Korea. Past attempts by Japan to resolve the issue in the ICJ were met with strong opposition from Seoul. Q: In spite of all this, Lee went ahead with the visit, didn't he? A: Genba said Japan no longer needs to give South Korea's stance on the issue any consideration and can go ahead with filing a suit with the ICJ. "Hey, look at us! We got your island. Nayh, nayh, nayh, nayh, nayh!" The screenshot to the left is of a December 22, 2006 Email I received from the English Department Head at Gachon University in Incheon, South Korea, where I worked as an English instructor for six years. The email informed me that my employment contract with the school would not be renewed for the 2007 school year. The Department Head believed it was because of my Dokdo postings on the Internet. She wrote: "I think there is little doubt that the school made this decision because of the Dokdo problem." Yesterday, I called again to the Dean of Academic Affairs and urged him to quickly make a decision on your contract problem. This morning, at a meeting attended by the president and the deans of the school, your contract problem was discussed, and it was decided that your contract would not be renewed. I was informed by the Dean of Academic Affairs at about 11 a.m. At the time I was on a train to Daejeon to attend an academic meeting, so I could not contact you right away. I am contacting you now after having arrived home just a little while ago. I think there is little doubt that the school made this decision because of the Dokdo problem. It also hurts me to have to relay this news. The English Department at the school had two Korean professors and two foreign instructors, including me. In addition to getting the above Email from the Korean professor who was the department head, I also secretly recorded the other Korean professor telling me in both Korean and English that she was in the room arguing that my contract be renewed when the Dean of Planning told her "The Dokdo problem is just too big" to renew my contract. The Dean of Planning had told me just a month or two earlier that I did not have to worry about not being rehired. Soon after I posted the news on the Internet, I got a call from a Korea Times reporter asking to interview me. I agreed and met her at the McDonalds at the Sinchon Rotary subway entrance. She asked me to bring the secret recording and the copy of the Email I received. The article she wrote about the interview can be read HERE. According to a New York Times article entitled "South Korean Denied Medal After Political Statement," South Korean soccer player Park Jong-soo was barred from receiving his bronze medal at the London Olympics on Saturday for displaying a Korean sign that read "Dokdo Is Our Land" (독도는 우리 땅). Mr. Park was not on the podium with his teammates at the medal ceremony. Mr. Park held up the sign after South Korea's 2-0 victory over the Japanese soccer team. The article said that Mr. Park faces investigations by both the International Olympic Committee and FIFA, soccer's governing body, because both organizations strictly enforce rules forbidding athletes from making political statements on the field.